The Magnificent Ambersons (1918) earned Tarkington one of his two Pulitzer Prizes, this one in 1919. The story traces the decline of three generations of an Indianapolis aristocratic family, from the Civil War through the rapid industrialization of the early twentieth century. Their flagging fortunes are in sharp contrast to the great prosperity of tycoons in industry and "new money" families who "did something" rather than merely trading on their family's name. The book is the second in Tarkington's trilogy, adapted as an acclaimed movie by Orson Welles in 1942. 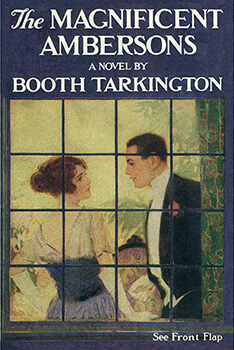 We feature Tarkington's book in Pulitzer Prize Fiction. Return to the Booth Tarkington library.